Last night was Film Club night – we watched Frida. It’s very good – you should watch it! Most Film Club nights end up with us nipping over to Moes (poor mans Nandos) for half a chicken and rice because we haven’t got any food left over from lunchtime. 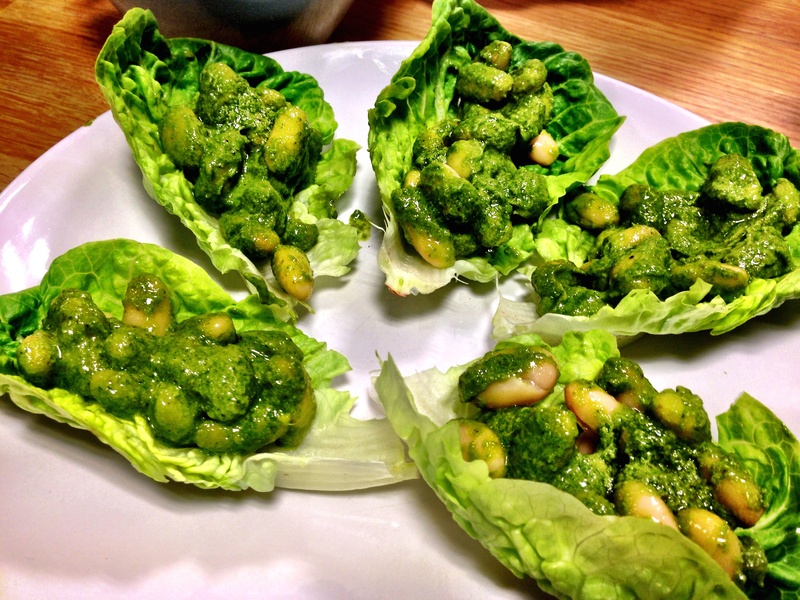 I was better prepared this week and made this pesto which, when mixed with white beans and served on lettuce leaves, makes for a very nice snack. It probably would have gone very well with some chicken from Moes! Pesto has undergone quite the transformation over the years. My first recollections of it were the Sacla jars which you would stir through some pasta when you were too lazy to cook anything proper. Since then everyone and his dog has been making their own jars of the stuff, including Jamie Oliver and Lloyd Grossman. I’ve always found them very vinegary or jar/tin tasting which I imagine is down to the preservatives they add. I always understood pesto to be basil, garlic, pine nuts and parmesan blended with olive oil but it is seems that the current trend is to call any blend of herb, nut, oil and cheese a pesto. Strictly these variations aren’t pestos – but then again there’s lots of fizzy white wines passing themselves off as champagne these days! I’ve made many different types in the last year, ones with coriander, parsley, different cheeses, different oils and a variety of nuts. This pesto from Hugh Fearnley Whittingstall’s ‘River Cottage Light and Easy’ is another variation on a theme – but its one of the best I’ve made. Simply blend parsley leaves, garlic, a tin of anchovies (oil as well), walnuts, some rapeseed oil and a little lemon juice to taste and you’re done. If you have a Nutribullet you can made this in less than a minute and it will be very smooth. I’ve copied Hugh’s serving suggestion of stirring through some white beans and laying on some lettuce leaves. I loved this. It has a real punch to it. Many pestos are quite bland but this is far from it. The anchovy really packs in flavour. Just don’t add more salt – anchovies are salty enough as it is. There was quite a bit left over which I imagine we will use up with some feta and salad in our tortilla wraps for lunch today. So far I’m really enjoying this book. Simply cooking. Great taste. That’s what we all need when we have little time to spare.